How much do you beat yourself up for stuffing things up? Most of us have this negative sound loop playing when we make mistakes that easily knocks the crap out of us. But I think it’s a heap worse to have a bundle of life enhancing dreams go flying by simply because of the stuffing up fear. That’s when life gets wasted. But that’s not to say go chasing after every bright shiny object that calls itself a dream. The trick is knowing where the differences are. I have a few friends who come from family and social groups who belittle anyone being big and brave and giving a crack at their dreams. I listen in horror as they tell, in terms that show just how normal it is, of what’s said to discourage them – “oh, that will never work, why do you think you can do that?” or “You don’t know how to do that, who do you think you are?”. Well you know what, as a baby we didn’t know how to crawl without learning, and we did that, we didn’t know how to walk and we learnt that too! We have to learn everything in life. As simple as that. And falling over a bundle of times when we’re learning to walk is normal, so it is too with any new skill. I don’t know any dream that doesn’t require you to keep learning so you can live it. So let them leave the small lives they are content with, go make yours bigger and richer! A treasured girlfriend has just left on a year’s travel around the world, she had to learn about the different visas and vaccinations required for all manner of places. She’s learnt bits and pieces of different languages, figured out how to pack as lightly as possible for a stack of different climates, and the list goes on. And she’s figured it out. And she’ll come across unexpected experiences that will require her to adapt and learn again. I’ve no doubt that she’s probably made some mistakes along the way already and more are yet to come. That is all perfectly fine, it’s part of living a rich and varied life. She is living her big dream of exploring. When I was learning about working with porcelain clay I stuffed something up just about every firing. The challenge would have been if I hadn’t learnt something from each firing. I have to figure out how the clay likes to be handled at each stage, straight out of the bag, leather-hard, bisque fired and fully vitrified. Each lesson was taught basically by me breaking things. Once the clay is transformed into porcelain after two high temperature firings it can handle daily life, but while it is still clay it needs careful handling. Simple. Now I have the dream of being able to throw beautiful things on a pottery wheel. Going into this I know I’ll have to learn a great deal but I’m confident that I have the capacity for this, because I’ve done it with a heap of other things. Whether these pieces will ever become part of the Creatively Belle collection is something else entirely, and at this stage, that’s perfectly fine. That’s where the trick is, giving things a go and finding out what you can and can’t do. Or, maybe more appropriately, what you can learn to do but find other options are better. My stubborn and determined streak comes into play for me in these things. I’ll persevere until I get the answer. Then I may decide that my efforts are better spend elsewhere. I learnt how to knot pearl necklaces but realised it would take hundreds of knots before I would be as good as my friend who I buy my pearls from so I’m better off leaving that side to her. 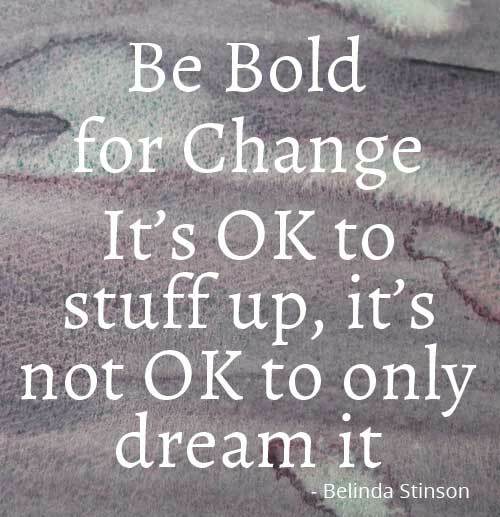 I think most small business owners come across people who have all the talk about making their dreams happen and are quite happy to criticise us and our efforts but never actually take the risks to do the walk, to make their dreams real. I use to get really annoyed with them, now I see them more for what they are allowing to happen – have their lives ruled by fear. We all face fears when we’re working on making our dreams happen. That is part of the experience and to be frank, if you’re not feeling daunted and overwhelmed by it at times then something is wrong. Maybe you’re playing too small? But dreams don’t have to be big and brash. They can be something others may perceive to be small but means a great deal to you. They are your dreams, no one else’s. I had a dream to paint. Once I realised I didn’t have to be as magnificent as someone like Monet, that I could be just me, it was a whole heap easier. Now I paint. I go to weekly art classes and love it. I also know that I’ll keep growing with it too, the more brush miles the more experience and skill. Now my dream to paint isn’t one of those big loud audacious dreams. I just want to paint. As a micro creative business owner who loves making her living from what she makes the dream of having my paintings and photography, writings and words on my own stationery collection is another dream, maybe a little bit more recognisable as a bigger dream, but a dream just the same. At each stage of manifesting these dreams I am stuffing up regularly. And if I wasn’t I’d be worried. Who is able to instantly get everything right when they’re starting something, doing what is for them a big and brave and bold thing? 1. Take time to learn from others already doing it (or something similar) and plan. Reinventing the wheel is a waste of time and effort so learn from what others are already doing. 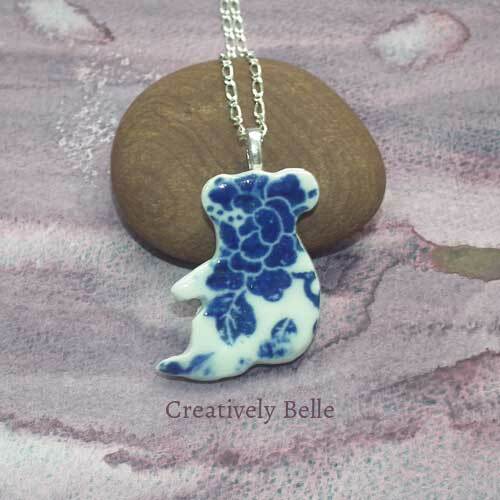 When I started with the porcelain jewellery I had to figure out findings. I looked at what others were doing, how to practically implement the options and made my decisions. Once I got a feel for it all I reworked my original plans for this new product range. Adapting my plans as I learn and explore is really important for me, letting me focus on some ideas and letting others go. 2. Test ideas and designs. With all my jewellery designs I’ve always started with a small sample and seen what works at market. The same goes with the stationery collection, I’ve experimented with ideas and designs in smaller quantities to find what works. This has been key for me in refining my design process, again for both the ceramic jewellery and stationery, asking for feedback is vital. Just being told, “Oh they’re wonderful” isn’t useful. Being told what does and doesn’t work and why from another person’s perspective is gold. These two way conversations are really empowering and are a blessing in themselves. You may not always like all that’s shared but it’s important to hear it. 4. Gamble what you can afford to loose. 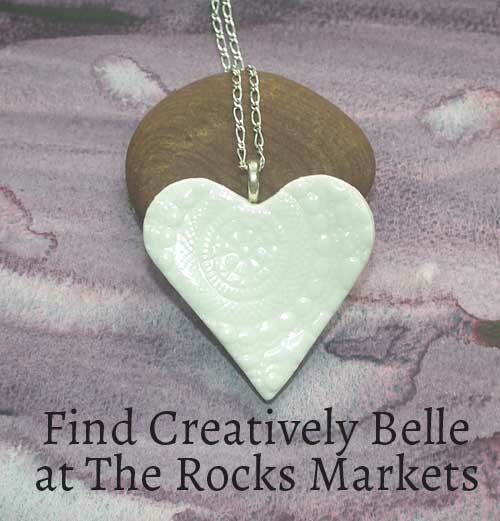 When I started experimenting with my ceramic necklaces and brooches I was only really gambling about $50 and about 20 hours of my time. I kept the risks low so I could afford to explore this dream about working in clay. Here I must confess that I see gambling in itself as an expensive past time with little reward, I don’t see myself as a gambler. But as a small business owner taking risks and giving something a go is inherent in my nature, I do it regularly, and this is a form of gambling. The difference to me is that the odds are not stacked against me as they are in the gambling world (where others are there to have highly profitable businesses, which they obviously do have). So you need to figure out what sort of risks you’re going to work with. 5. Be honest with yourself about why you’re doing what. I think this is particularly important for anyone looking to start a business as part of their dreams. If you’re doing it for weak reasons like ego or external validation I think it will be exceptionally hard to get through the tough parts. If you’re doing it for more authentic and deeper reasons then half of the difficult days won’t even feel challenging anyway; just think of what it takes for a successful, loving long term relationship. Honesty around the why is crucial. Some dreams are much harder to bring to life than others, and that’s a good thing. Why should everything be easy or hard, why not have a spectrum? And we can’t all be chasing after every dream that we come along, otherwise none of our dreams would come to fruition. The worst thing is letting go of dreams simply because of fear of stuffing up. Go and stuff up, fall over, break your nose, pick yourself back up and take down notes about lessons learnt, then get going again. Chasing your own dreams and taking a few tumbles? Share what’s been happening with you and what’s enriching your life.